Acute rheumatic fever (ARF) is an autoimmune inflammatory process that develops as a sequela of streptococcal infection. ARF has extremely variable manifestations (see the image below) and remains a clinical syndrome for which no specific diagnostic test exists. Persons who have experienced an episode of ARF are predisposed to recurrence following subsequent (rheumatogenic) group A streptococcal infections. The most significant complication of ARF is rheumatic heart disease, which usually occurs after repeated bouts of acute illness. Clinical manifestations and time course. Molecular mimicry accounts for the tissue injury that occurs in rheumatic fever. Both the humoral and cellular host defenses of a genetically vulnerable host are involved. In this process, the patient's immune responses (both B- and T-cell mediated) are unable to distinguish between the invading microbe and certain host tissues. T helper 1 and cytokine Th17 appear to be key mediators of rheumatic heart disease. The resultant inflammation may persist well beyond the acute infection and produces the protean manifestations of rheumatic fever. The incidence of ARF has declined markedly in the past 50 years in both the United States and Western Europe. Most Western physicians see only the late sequelae of rheumatic heart disease; the diagnosis of an acute case is usually reason enough for a grand rounds presentation. This remarkable decline of rheumatic fever likely reflects improved socioeconomic conditions, as well the decline in prevalence of the classically described rheumatogenic strains of group A streptococci. The incidence rate of rheumatic fever is as high as 50 cases per 100,000 children in many areas. Areas of hyperendemicity (eg, indigenous populations of Australia and New Zealand) see an incidence of 300-500 cases per 100,000 children, while the rates are approximately 50-fold lower in their nonindigenous compatriots. Rheumatic fever in the 21st century appears to be largely a disease of crowding and poverty. ARF is predominantly a disease of developing countries and is concentrated in areas of deprivation and crowding. It is rampant in the Middle East, in sub-Saharan Africa, in the Indian subcontinent, in certain areas of South America, in Oceania, and especially among the indigenous populations of Australia and New Zealand. Although a genetic predisposition to ARF clearly exists,  the disease does not seem to have a major racial predisposition, as it was once common in the United States and Europe and seems to decline in any locale where living conditions improve. Rheumatic fever does not have a clear-cut sexual predilection, although certain clinical manifestations, such as mitral stenosis and Sydenham chorea, are more common in females who have gone through puberty. ARF is most common among children aged 5-15 years. It is relatively rare in infants and uncommon in preschool-aged children. ARF occurs in young adults, but the incidence of first episodes of ARF falls steadily after adolescence and is rare after age 35 years. The lower rate of ARF in adults may represent a decreased risk of streptococcal pharyngitis in this cohort. Recurrent episodes, with their predisposition to cause or exacerbate valvular damage, occur until middle age. Cilliers AM. Rheumatic fever and its management. BMJ. 2006 Dec 2. 333(7579):1153-6. [Medline]. Stollerman GH. Rheumatic fever. Lancet. 1997 Mar 29. 349(9056):935-42. [Medline]. Bisno AL, Pearce IA, Stollerman GH. Streptococcal infections that fail to cause recurrences of rheumatic fever. J Infect Dis. 1977 Aug. 136(2):278-85. [Medline]. Shulman ST. Rheumatic heart disease in developing countries. N Engl J Med. 2007 Nov 15. 357(20):2089; author reply 2089. [Medline]. McDonald M, Currie BJ, Carapetis JR. Acute rheumatic fever: a chink in the chain that links the heart to the throat?. Lancet Infect Dis. 2004 Apr. 4(4):240-5. [Medline]. Carapetis JR, McDonald M, Wilson NJ. 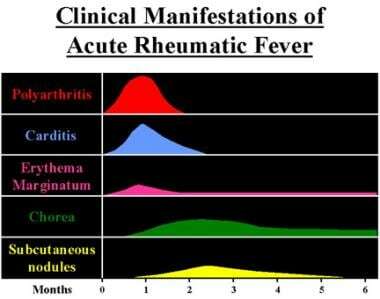 Acute rheumatic fever. Lancet. 2005. 366:155-68. [Medline]. Guilherme L, Kalil J, Cunningham M. Molecular mimicry in the autoimmune pathogenesis of rheumatic heart disease. Autoimmunity. 2006 Feb. 39(1):31-9. [Medline]. Guilherme L, Kalil J. Rheumatic Heart Disease: Molecules Involved in Valve Tissue Inflammation Leading to the Autoimmune Process and Anti-S. pyogenes Vaccine. Front Immunol. 2013. 4:352. [Medline]. Veasy LG, Wiedmeier SE, Orsmond GS. Resurgence of acute rheumatic fever in the intermountain area of the United States. N Engl J Med. 1987 Feb 19. 316(8):421-7. [Medline]. Wallace MR, Garst PD, Papadimos TJ, Oldfield EC 3rd. The return of acute rheumatic fever in young adults. JAMA. 1989 Nov 10. 262(18):2557-61. [Medline]. Erdem G, Dodd A, Tuua A, Sinclair S, I'atala TF, Marrone JR, et al. Acute rheumatic fever in American Samoa. Pediatr Infect Dis J. 2007 Dec. 26(12):1158-9. [Medline]. Watkins DA, Johnson CO, Colquhoun SM, Karthikeyan G, Beaton A, Bukhman G, et al. Global, Regional, and National Burden of Rheumatic Heart Disease, 1990-2015. N Engl J Med. 2017 Aug 24. 377 (8):713-722. [Medline]. Joseph N, Madi D, Kumar GS, Nelliyanil M, Saralaya V, Rai S. Clinical spectrum of rheumatic Fever and rheumatic heart disease: a 10 year experience in an urban area of South India. N Am J Med Sci. 2013 Nov. 5(11):647-52. [Medline]. Casey JD, Solomon DH, Gaziano TA, Miller AL, Loscalzo J. Clinical problem-solving. A patient with migrating polyarthralgias. N Engl J Med. 2013 Jul 4. 369(1):75-80. [Medline]. Atatoa-Carr P, Lennon D, Wilson N,. Rheumatic fever diagnosis, management, and secondary prevention: a New Zealand guideline. N Z Med J. 2008 Apr 4. 121(1271):59-69. [Medline]. Gewitz MH,Baltimore RS, Tani LY,et al. Revision of the Jones Criteria for the diagnosis of acute rheumatic fever in the era of Doppler echocardiography: a scientific statement from the American Heart Association. Circulation. 2015 May 19. 131 (20):1806-18. [Medline]. Weiner SG, Normandin PA. Sydenham chorea: a case report and review of the literature. Pediatr Emerg Care. 2007 Jan. 23(1):20-4. [Medline]. Marijon E, Ou P, Celermajer DS, Ferreira B, Mocumbi AO, Jani D, et al. Prevalence of rheumatic heart disease detected by echocardiographic screening. N Engl J Med. 2007 Aug 2. 357(5):470-6. [Medline]. Marijon E, Ou P, Celermajer DS, Ferreira B, Mocumbi AO, Sidi D, et al. Echocardiographic screening for rheumatic heart disease. Bull World Health Organ. 2008 Feb. 86(2):84. [Medline]. Vijayalakshmi IB, Vishnuprabhu RO, Chitra N, Rajasri R, Anuradha TV. The efficacy of echocardiographic criterions for the diagnosis of carditis in acute rheumatic fever. Cardiol Young. 2008 Oct 10. 1-7. [Medline]. Sahin M, Yildirim I, Ozkutlu S, Alehan D, Ozer S, Karagöz T. Clinical features and mid- and long-term outcomes of pediatric patients with subclinical carditis. Turk J Pediatr. 2012 Sep-Oct. 54(5):486-92. [Medline]. Narula J, Kaplan EL. Echocardiographic diagnosis of rheumatic fever. Lancet. 2001 Dec 8. 358(9297):2000. [Medline]. Tubridy-Clark M, Carapetis JR. Subclinical carditis in rheumatic fever: a systematic review. Int J Cardiol. 2007 Jun 25. 119(1):54-8. [Medline]. Kaplan EL, Anthony BF, Chapman SS, Ayoub EM, Wannamaker LW. The influence of the site of infection on the immune response to group A streptococci. J Clin Invest. 1970 Jul. 49(7):1405-14. [Medline]. Ayoub EM, Nelson B, Shulman ST, Barrett DJ, Campbell JD, Armstrong G. Group A streptococcal antibodies in subjects with or without rheumatic fever in areas with high or low incidences of rheumatic fever. Clin Diagn Lab Immunol. 2003 Sep. 10(5):886-90. [Medline]. Wilson NJ, Voss L, Morreau J, Stewart J, Lennon D. New Zealand guidelines for the diagnosis of acute rheumatic fever: small increase in the incidence of definite cases compared to the American Heart Association Jones criteria. N Z Med J. 2013 Aug 2. 126(1379):50-9. [Medline]. Shivaram P, Ahmed MI, Kariyanna PT, Sabbineni H, Avula UM. Doppler echocardiography imaging in detecting multi-valvular lesions: a clinical evaluation in children with acute rheumatic fever. PLoS One. 2013. 8(9):e74114. [Medline]. Pereira BA, da Silva NA, Andrade LE, Lima FS, Gurian FC, de Almeida Netto JC. Jones criteria and underdiagnosis of rheumatic fever. Indian J Pediatr. 2007 Feb. 74(2):117-21. [Medline]. Voss LM, Wilson NJ, Neutze JM, Whitlock RM, Ameratunga RV, Cairns LM. Intravenous immunoglobulin in acute rheumatic fever: a randomized controlled trial. Circulation. 2001 Jan 23. 103(3):401-6. [Medline]. Kim ML, Martin WJ, Minigo G, Keeble JL, Garnham AL, Pacini G, et al. Dysregulated IL-1β-GM-CSF Axis in Acute Rheumatic Fever That Is Limited by Hydroxychloroquine. Circulation. 2018 Dec 4. 138 (23):2648-2661. [Medline]. Bilavsky E, Eliahou R, Keller N, Yarden-Bilavsky H, Harel L, Amir J. Effect of benzathine penicillin treatment on antibiotic susceptibility of viridans streptococci in oral flora of patients receiving secondary prophylaxis after rheumatic fever. J Infect. 2008 Apr. 56(4):244-8. [Medline]. Dale JB. Current status of group A streptococcal vaccine development. Adv Exp Med Biol. 2008. 609:53-63. [Medline]. Schödel F, Moreland NJ, Wittes JT, Mulholland K, Frazer I, Steer AC, et al. Clinical development strategy for a candidate group A streptococcal vaccine. Vaccine. 2017 Apr 11. 35 (16):2007-2014. [Medline]. Lopez-Benitez JM, Miller LC, Schaller JG, Moreno LM, de Canata ME. Erroneous diagnoses in children referred with acute rheumatic fever. Pediatr Infect Dis J. 2008 Feb. 27(2):181-2. [Medline]. Veasy LG. Time to take soundings in acute rheumatic fever. Lancet. 2001 Jun 23. 357(9273):1994-5. [Medline]. Ragupathi L, Herman J, Mather P. Late Recurrence of Rheumatic Fever. Am J Med Sci. 2015 Oct. 350 (4):342-3. [Medline].